Teddybear (known as Teddy!) came to the sanctuary about six years ago with his brother Trigger. 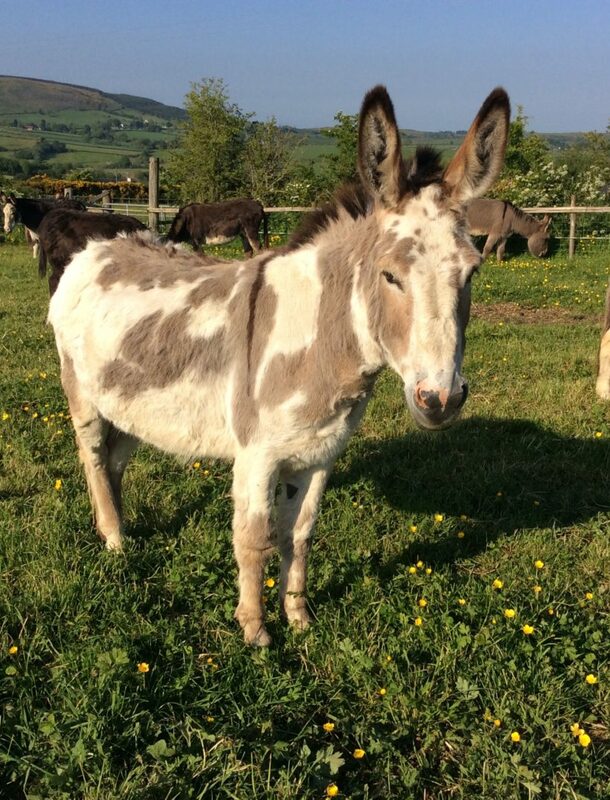 Teddy is a beautiful donkey with gorgeous brown and white markings. He is a very healthy and physically strong but Teddy’s problems are not visible to the human eye. Teddy has lots of psychological problems and can be severely anxious. Several attempts have been made to rehome him but he collapsed on the horse box at the prospect of leaving the sanctuary. We will never know what horrible memories he holds or what he endured in his earlier life.His brother Trigger was in a much better state of mind and was a strong domineering donkey. Donkeys form their own special friendships and thankfully Teddy has two loyal friends in the form of Ben and Big Jay. The trio are inseparable and enjoy a great quality of life. Trigger was rehomed a number of years ago as he left Teddy alone and formed his own friendships within the herd. Teddy will remain at the sanctuary for the rest of his life as it would be too cruel to tear him away from the only happiness he has known.